Now if you ask me, I think it's pure madness to sell substances with codeine in them over the counter at a pharmacy, and I'm also a bit iffy about buying paracetemol in the supermarket, given that any 13 year old can go in and stock up on a drug that is lethal in relatively small doses. But there are rules, I know that. Even back then my pharmacist friend did say that apparently you are only allowed to sell them one box at a time, which I've never seen enforced. The Solpadeine issue is a bit different as you can only buy it at chemists, and for the past year or so, there is a new law - a very Oirish law - and it seems to be this: you can buy Solpadeine over the counter no problem, but only if you get a lecture first. You get asked what you want it for, which is all a bit communist to me, and then they ask you if you've tried this that and the other non-solpadeine/codeine solutions. But more than that, they make you feel guilty, they make you feel like a druggy, they make you feel like you don't have a clue what you want but have randomly chosen this brand of pain killer, and they also make you feel like you're back at school and in trouble for something that you are not quite sure you have done. It's true that Solpadeine is a dangerous thing and many people are addicted to it. It is true that many people are just as well off using paracetemol instead but are in the habit of asking for solpadeine, and it is also true that sometimes you just go for the solpadeine because hey, there's codeine in it, and it'll give you a bit of a lift. But what the hell is this lecture lark all about? Either ban it as an over the counter drug or sell it over the counter, but this in between school teacher lecture is a joke. I bet that the pharmacists who give you the lecture are the very people who don't want it banned, because after all, if they did ban it, think about how their business would suffer. And they do not like to be reminded of that while giving you the lecture, as I was to find out recently. I buy Solpadeines about once every two or three months, but I've started pharmacy hopping just to look good and I always lie about why I want it. Nothing to hide, but I feel it's an invasion to your privacy to tell some stranger why you are buying the stuff that pays their mortgage. If I have a toothache, I'll say leg injury and the time I had an abscess on my foot I said they were for bad period pains. I wonder what you'd have to say for them to refuse you. And would they refuse you? I'd love to say it's for a hangover, or that I don't have any pains but am just buying them specifically for the codeine hit. After all, the questions they ask are only to ensure that you know exactly what it is you are buying, not to stop you buying them. So yesterday, when I walked into the pharmacy with a cold sore that has spread across my face making me look like the love child of Elephant man and a leper, with the Herpes virus sending little electric shocks to anyone who came within three feet of me, and hardly able to speak through my scabby lips, the pharmacist still rattled off her little lecture and asked me what it was exactly that I wanted the Solpadeine for. It would be nearly worth severing off a limb and carrying it into the chemist asking for Solpadeine just to see would she still ask? So I told her that I had bad stomach cramps and I thought I'd be smart, so I pulled out a pack of Solpadol which I'd been given as a prescription a few weeks back and said 'look, I know the lecture and all that, but I'm on these stronger pills and would prefer something less drowsy.' I then realised that this was a bad idea, because if these drugs are that dangerous, wouldn't it be lethal to top up someone's solpadol with solpadeine? But she only wanted to know one thing - did I want a pack of 12 or 24. That's the best of all, once they 'allow' you to buy the things, they want you to buy two dozen. A bit disingenuous if you ask me. Surely if they are so goddamn concerned about your welfare taking these tablets would they not offer to sell you two, or four and to come back tomorrow? You'll be glad to know I just bought the pack of 12. Then I went next door to the supermarket and bought a bottle of gin, a bottle of butane gas and a large pizza. No questions asked. 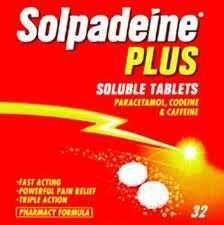 Classic, The elephant in the room for all us solpadeine lovers and our friendly pharmacist. What legal right has a chemist or assistant to ask personal questions within earshot of other customers. It must be a violation in todays info sensitive society. I came out of Tescos pharmacy with a pressure headache after the grilling and I went in for post-op pain relief for my shoulder. The assistant looked to be enjoying the element of control. Will buy online now and spend less time in Tescos and save cash! You can ask to speak to your pharmacist privately if you wish as all pharmacies have consultation rooms and have notices displayed to that effect. Pharmacists should be discreet and private in establishing appropriate use. My Gran was prescribed these years ago in the days when they weren't available OTC. After taking them for a few days Mum asked how she was getting on with them she replied that they were working well, but didn't 'alf make you fart. Might I just enquire, are you 'oirish' yourself? In Ireland this seems to be a recently imported 'nanny england' state of affairs in the local chemist. They are frequently told the most outrageous lies, by way of saying it isn't your business. You can't blame the 'Oirish' for this one. As a pharmacist and also one who knows Mags- not from her Solpadeine buying but through writing- may I state that we are legally obliged through pharmacy regulations to 'lecture' each person who request Solpadeine. No matter how you try to turn the queries into a conversation, we inevitably feel like an interrogator. We dearly hope that it becomes a prescription only medicine. There are many people addicted to the medicine and only last week, I had an embarrassing situation with a neighbour who was obviously overusing Solpadeine. I sat with her in the consultation room and explained the effects of long term use. Both of us were embarrassed and I certainly would prefer to not be in this situation. Some years back before regulation, I assisted a dependent customer in weaning off her Nurofen Plus with the co-operation of her GP and a counsellor. She is still a patient of the pharmacy and appreciates the intervention. So, like the customer looking for the product, the current regulations have made it equally awful for the pharmacist. But we are obligated to comply with the regulations set for us. So, like the customer looking for the product, the current regulations have made it equally awful for the pharmacist. But we are obligated to comply with the regulations set for us.And it is not about the sales- as a pharmacist, yes I need to make a living but I am a pharmacist because I am concerned for the health and well being of my customers. Oh wow what a lift you have given me...just roaring laughing at my screen here getting funny looks!!! soooo true and the best post I have ever seen on this!! well done and well said...give me more!! !